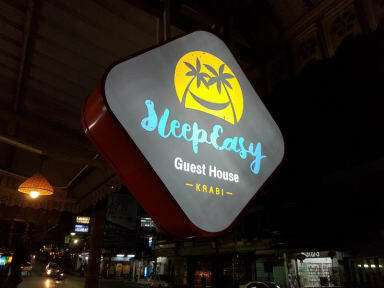 Sleep Easy Krabi is an Eco-Friendly Hostel located in the heart of Krabi town set in a friendly neighborhood and situated alongside the Krabi River. It is close to the Boat Pier for Railey beach, Walking Street, both Night and Weekend Markets, stores, bars & restaurants and just 20 minutes from Ao-Nang Beach. Sleep Easy Krabi is a family run business and has 9 rooms in total, ALL with SHARED shower/toilet facilities. There is 1 x Private Single Fan Room, 1 x Twin Fan Room, 1 x Basic Twin Fan Room, 1 x Twin A/C room, 1 x Double Fan Room, 1 x Double A/C room, 1 x Triple A/C Room, 1 x Dormitory A/C 'bunk style' room suitable for 4 people and 1 x spacious Family A/C room with 1 x Double sized bed and 1 x Single bed. We provide high quality mattresses and bed linen, super friendly service and a cool bar downstairs with a cosy and inviting living space. There is a also a functional work space to set up your laptop with access to free Wi-Fi throughout the building. ALL Rooms are 'SHARED' Bathrooms. Een zeer aangenaam verblijf! Heel vriendelijke staff, die ontzettend behulpzaam is. Locatie is ideaal: op een verbindingsweg in Krabi Town. Op vrijdag, zaterdag en zondag is er op 2 minuten wandelen een walking street en achter de hoek is elke avond een nightmarket waar je lekkere verse vis kan eten! Het was een geweldige kamer, rustig in het hostel zelf. 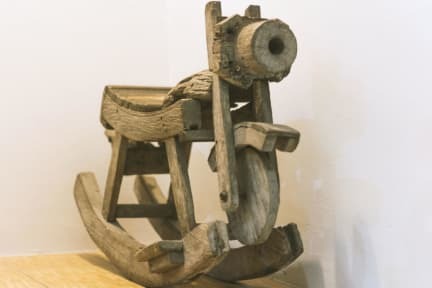 Indien we terugkeren naar Krabi (ooit), verblijven we zeker opnieuw in Sleep Easy! Wayne and Pauch were without a doubt the most kind and helpfull hosts I've met during my trip. They really made me felt at home! The hostel is very neat and clean and has a great atmosphere. Thanks for everything! The owner is a cool, friendly and helpful guy. Not the place to party, but a place to sleep easy. Nice and helpful staff, good beds, clean bathroom, hot shower. Good location. Not the place to meet new people, but definitely recommendable for couples. Really warm welcome from the owner! Everything was really clean and the location was awesome. We only stayed 1 night but i would recommend this place to anyone who visit Krabi! Fine hostel, but the twinroom does not have a window. There is a lot of noise from the room next door and downstairs but in the end you get what you paid for which is fine.